The table was set by new investor / operator Anthony Precourt when it was announced that the team would honor Landon Donovan before the match. While Donovan has never played for the Columbus Crew he has made more than a handful of memories for local fans through his heroics with the men’s national team. Many of the same fans cheering him on during all those dos a cero matches though, wanted to make it clear that those deeds have nothing to do with these deeds in league play. The ceremony before the match was, of course, attended by Precourt but also former teammates (and one would assume, friends) of Donovan, Gregg Berhalter and Frankie Hejduk. In fact, in all likelihood the idea probably came from Hedjuk. It was as classy as an on-field presentation could be and the star of the show even appeared to tear up. Into the match we jumped. 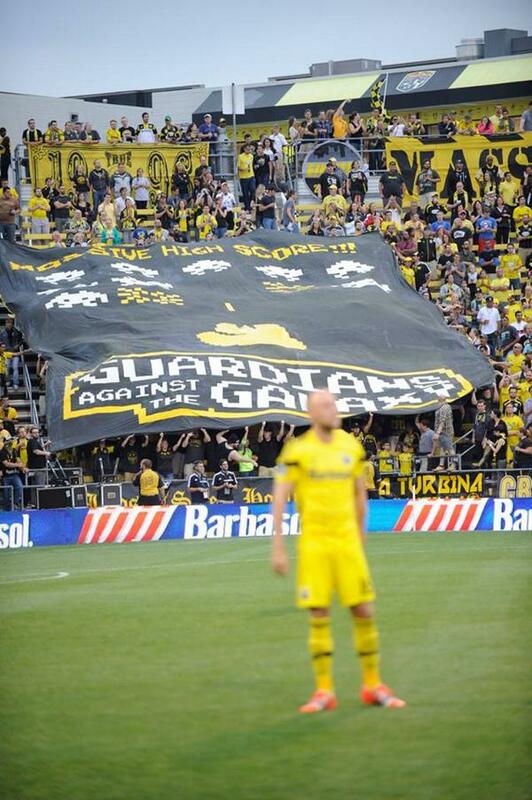 With the first tifo raised in the Nordecke gone I breathed both a sigh of relief that it wasn't something calling Donovan out specifically. Not because I don’t think the supporters should have stayed away from the eyebrow raising thought of honoring a player on another team but because I could see what the Crew, as an organization, is trying to do. At least, what I think they were. Columbus isn't seen as a destination city. A great place to live, yes. A great place to raise a family, yes. Many, many other things and I have enjoyed my time here - but one thing it is not is a place for a male 20-something professional athlete that has a bit of cash in the bank. On top of that, the Crew have a recent history of mistreating players and being generally poorly run. Perhaps it can be traced back to 2010 when the team was broken down. Was it the right thing to do? Lots of different answers to that. One thing we can answer is the way it happened didn’t go over well with players. Events don’t happen in a bubble where other players don’t pay attention. Soccer, unlike other US sports leagues, is unique in that good-to-great players have dozens of options not just a couple. So when a city gets a reputation (even if it isn’t that bad of one) from a front office or coach or bad facilities it causes a player to put it down the list of places to go. You see this everywhere, not just in Columbus. So, when Precourt and the Crew announced they were honoring Landon Donovan pre-match - it was a nice thing to do. Intentionally done to erase some of the wrongs in recent years or just done out of gentlemanly behavior, it was fine. What also matters is how the fans react to it. And react they did a few minutes before the match ended by raising a tifo painted last year that reads “New Heroes” with a stylized image of Jurgen Klinsmann. Those keeping track of the drama between Klinsmann and Donovan got the purpose of it. It was where most impactful tifos come from; that deep dark obsessive place in supporters’ hearts. Supporters’ voices are very important to the sport. Right or wrong, good or evil. There is no doubt they are necessary. This particular one though might have had unintended results, however. Be it good will towards an important player in US Soccer history, just showing class or trying to clean up the world view of Columbus, Ohio – the tifo undid just about all of that and shows that supporters are not in lock-step (un-knowingly, it seems) with the winds of change Precourt is trying to introduce. That’s not to say that it was wrong though. The other purpose of supporters is to give the team it’s shape. To represent the city. After what happened I’m thinking that the new front office might have a different view of things and that metropolitan image Precourt talked about doesn’t stick for a reason. The Crew ended up beating LA 4-1 in one of the best games I’ve seen the team play since I started writing about them four years ago.